JP Marine is a distributor for Poland of a leading marine diesel engine producer, MarineDiesel AB from Sweden. All MD engines are based on GM 6,5l V8 block, which is a successor of the 6.2l engine constructed in 1982. One advantage of basing on this engine is the fact that it has the same drive connection parameters as Volvo Penta, MerCruiser, OMC, or Marinepower. The MD engine has virtually the same dimensions and weight as GM 7,4l V8 petrol engine. In 2003, MD opened an engine factory in the USA (Stillwater Oklahoma) with the purpose of production for the US market. In 2004, MD signed a contract with Cummins MerCruiser Diesel Europe for the purchase of Z type transmission (sterdrive) as an OEM (Original Equipment Manufacturer), and finally took over the copyright. In 2006, MD started working on a series of 6,6l V8 diesel engine, to start a series production of the VGT line in 2009, thus becoming the first engine provider (OEM) for GM outside the USA. Years of development and experience have led to creating an extraordinary range of marine engines with a wide range of power, light, robust and with an exceptional power to weight ratio. The company`s head office and its production and development facilities are located in Angleholm, in the south-east part of Sweden. MD has a well-developed service and distribution network all over the world, and its sole distributor for Poland is JP Marine from Gdańsk with appropriate service facilities. 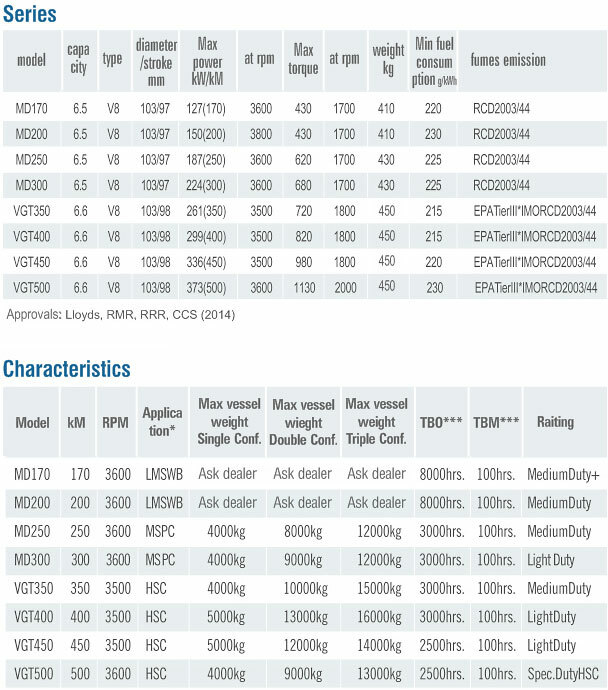 Below – in the power ranges – a comparison of selected diesel engines from different manufacturers in terms of basic parameters such as power, torque, speed, weight, dimensions, fuel consumption and emissions compliance with the standards. Torque is the parameter indicating availability of kinetic energy transmitted via the moving parts of the engine (pistons, flywheel) through the propeller to the environment which is water. The higher the torque, the better the boat`s acceleration and ability to maintain constant speed at rough sea. Apart from high torque, also important is its constancy at the widest range of engine revolutions. A frequent error of clients looking for an engine for their vessel is that they focus only on power and the highest level of torque given for one value of engine revolution speed. It is necessary to analyse the level of torque at full engine revolution range – the faster it reaches a high level that is close to the maximum and maintains it at the full revolution range, the better. This means that the vessel has the same acceleration at any revolutions (the flatter the curve that is close to the maximum torque, the better). Thanks to applying its engines for military and rescue purposes, Marine Diesel has created a range of diesel engines with an exceptionally flat curve of torque. Below are the curves of power and torque for VGT 350 hp engine. RHIBs: RHIB stands for Rigid Hull Inflatable Boat, and the VGT Series of engines is ideal for these vessels. Why? We are compact. Most RHIBs have very small engine compartments with little room for larger engines. We are powerful. Most RHIBs are used in situations where high speed and high performance are critical to mission success. Only the MarineDiesel VGT Series has the power and torque to excel in these applications. We are lightweight. One of the advantages of a RHIB design is the lighter weight over as traditional, non-inflatable hull. The VGT Series’ lighter weight than any competitor is a real advantage. Water Taxis: Water taxis tend to be lightweight, and operated continuously. The extended life-cycle of the VGT Series leaves recreational engines like Yanmar or Volvo Penta seriously lacking. The V configuration also means a tremendous reduction in vibration, with an increase in passenger comfort. Light Patrol Boats: MarineDiesel VGT Series are installed on many light patrol vessels (Under 15m). The high power, high and continuous torque, light weight, and easy maintenance give the MarineDiesel engines serious advantages over our competitors that design their engines for light, recreational use. The reliability provided by the VGT’s long life cycle also means that missions are not disrupted by mechanical failure. The programmable NIRA ECU also provides mission specific capabilities that other engine makes cannot match. Light Commercial Boats: Many VGT engines are installed on ski boats, parasailing boats, and small passenger ferries. Long life cycle, fuel efficiency, and high power when needed are distinct advantages. The cost of ownership of VGT engines can be less than half the long term cost of ownership of competitors’ products, a direct impact on the bottom line. Rescue Boats: Rescue boats require high level of performance and reliability. They often operate under WOT conditions, in rough weather. The VGT Series is designed for such operations.